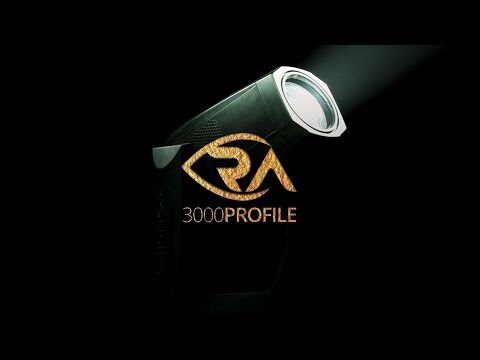 RA3000 Profile combines solid state technology in every single detail and it has been engineered to be the bright, high quality of light and silent. RA3000 PROFILE is able to output a real 25’000 lumen output with unprecedented beam evenness. The 6000 Kelvin, LED engine has been custom designed to make the RA 3000 on stage, or in front of a camera, hitting a CRI of 90, TLCI of 91, high R9 and TM30 making all skin tones and colors come to life. The unit is packed with a full feature set, composed by a Gobo Wheel, Animation Wheel, Iris, Prism and Dual linear frost. The high precision 4 blade shuttering system can be overlayed to provide endless combinations. The 19 element optics of the Ra3000 are precision engineered for a perfect Zoom, ideal edges and maximum efficiency. The Ra3000 is silent, bright, flexible and precise.